Samson Abramsky, who has played a leading role in the development of game semantics and its applications to the semantics of programming languages, has been awarded an Honorary Degree by Middlesex University. Game semantics is an approach to formal semantics that grounds the concepts of truth or validity on game-theoretic concepts, such as the existence of a winning strategy for a player. The Christopher Strachey Professor of Computing and a Fellow of Wolfson College, Oxford University has made notable contributions on domain theory in logical form, the lazy lambda calculus, strictness analysis, concurrency theory, interaction categories, and geometry of interaction. More recently, he has been working on high-level methods for quantum computation and information and was presented with the Honorary Degree at the University’s graduation ceremony today. 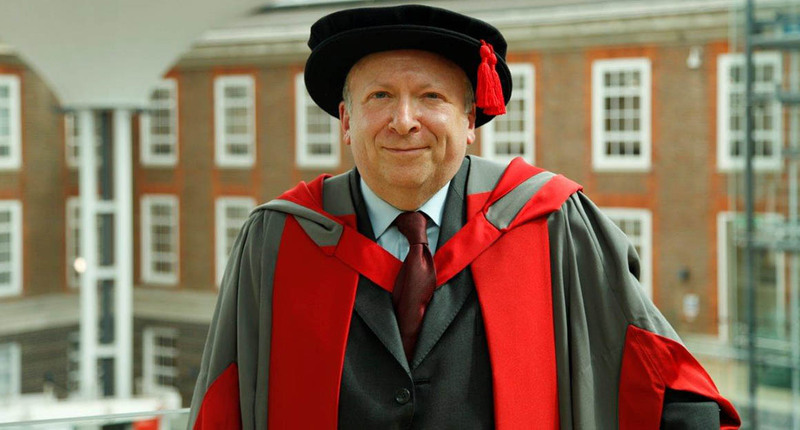 "It is a great honour to receive this honorary degree from Middlesex University," said Samson. Samson holds MA degrees from Cambridge and Oxford, and a PhD from the University of London. Previously he held chairs at the Imperial College of Science, Technology and Medicine, and at the University of Edinburgh. He is a Fellow of the Royal Society (2004), a Fellow of the Royal Society of Edinburgh (2000), a member of Academia Europaea (1993), and a Fellow of the ACM (2014). He is a member of the Editorial Boards of the North Holland Studies in Logic and the Foundations of Mathematics, and of the Cambridge Tracts in Theoretical Computer Science. He was General Chair of Logic in Computer Science (LiCS) 2000-2003. His paper, Domain theory in Logical Form, won the LiCS Test-of-Time award (a 20-year retrospective) for 1987. The award was presented at LiCS 2007. He was awarded an EPSRC Senior Research Fellowship on Foundational Structures and Methods for Quantum Informatics in 2007. He was the Clifford Lecturer at Tulane University in 2008 and was awarded the BCS Lovelace Medal in 2013.